Discount First Pitch Transporter Jr Cart - Free Shipping! As great as pitching machines are, they are not always the easiest things to move from a car to a ball field. 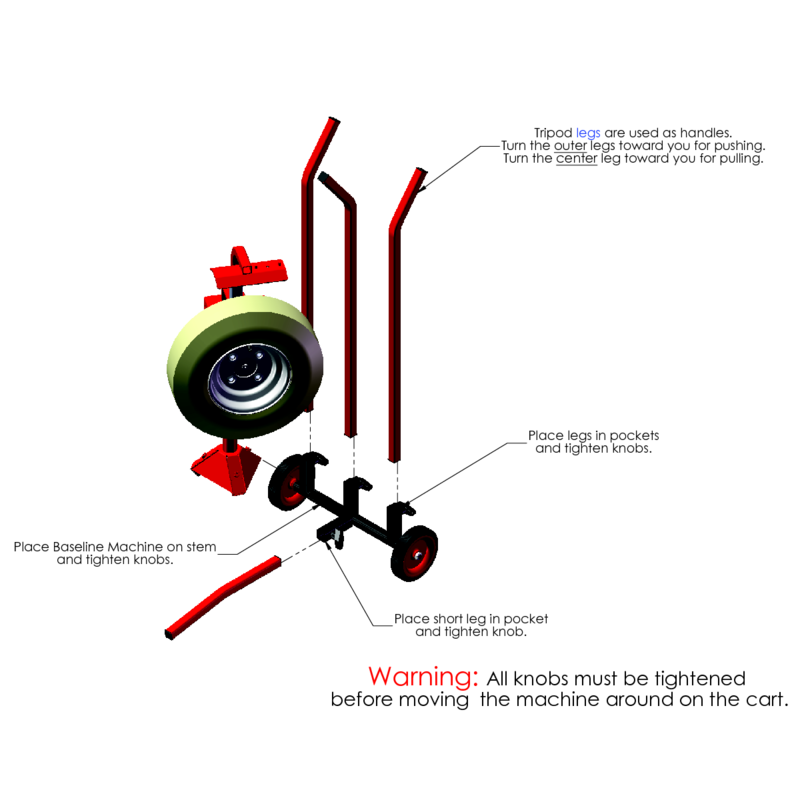 Usually, it is a two man operation or one person is stuck dragging the machine and potentially throwing out their back to move it all of the way. Fortunately, after folks have been begging for it for years, First Pitch has finally developed the First Pitch Transporter Jr. 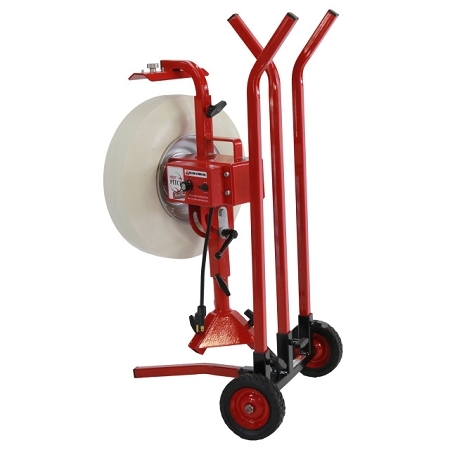 Simply place one of the approved First Pitch pitching machines on the specially designed cart, lock it into place and easily wheel it from your car to the field and back. What could be easier? Like all First Pitch products, the Transporter Jr features a 14 Day Satisfaction Guarantee. PLEASE NOTE: The First Pitch Transporter Jr. is only for TRANSPORTING a First pitch Relief Pitcher or Baseline pitching machine. The pitching machine CANNOT throw from the transporter and MUST be set up properly on its tripod legs in order to throw pitches. I bought the First Pitch Baseline pitching machine(works great and craftsmanship is excellent) but not the transporter.Hauled it to the ball park and knew right away I needed the cart.Well constructed and easy to take to the park,all the pieces fit nicely into the transporter.If you buy the pitching machine I would recommend getting the transport,works great. 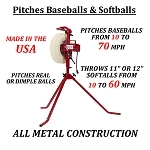 The Transporter Jr is made specifically for the following First Pitch pitching machines and is not approved for use with any other pitching machines. 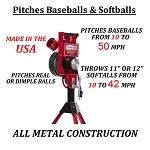 Using it with any other pitching machine is not covered by any warranty that First Pitch may offer in the future. To ensure your satisfaction, the First Pitch Transporter Jr includes a 14 Day Money Back Satisfaction Guarantee. Returned items must be in good, resellable, "like new" condition with original packaging. Unless returning an item that is defective, customers are responsible for the return shipping costs to First Pitch as well as the original actual shipping costs, whether they obtained "free" shipping or not. There is also a 10% restocking fee on all returned items. No matter where you order a First Pitch Transporter Jr from, NOBODY actually stocks them; they all ship directly from the manufacturer's warehouse located in Maple Plain, Minnesota. Therefore, the shipping time frame is exactly the same no matter what website you order from (we hope that it is this one!). First Pitch Transporter Jr Transport Carts typically take 2-4 business days to ship from the time you place your order. They ship via Federal Express (FedEx) Ground and could take anywhere from a day or two to a week to get to you AFTER being shipped, depending on your proximity to their warehouse. We will notify you of your tracking number the moment we receive it from the manufacturer's warehouse.